Are fine art prints ‘original prints’ or ‘reproductions’? In a previous blog I talked about the distinction between a so-called ‘Limited Edition’ and an ‘Open Edition’ prints. There is a similar argument about the difference between ‘Original Prints’ and ‘Reproductions’. To many outsiders the use of words here is very puzzling. Surely they say ‘all prints are reproductions’. Not so say printmakers. Some say that ‘original prints’ are works of art deliberately made using print-making techniques like etching or engraving, whereas copies of paintings are ‘reproductions’. Their argument goes that technology enables photographic reproductions of paintings that were created as paintings with no preconception of being published. Some publishers are printing these reproductions and, even worse, some are calling the prints ‘limited editions’. This has upset some of those artists who use traditional printmaking methods. They want the publishers to be honest and call copies of paintings ‘reproductions’. The focus here is on whether the artist was deliberately creating an image for a print run or not. If the artist’s primary purpose was to create a painting, and the print just copies that painting, then it is a reproduction. 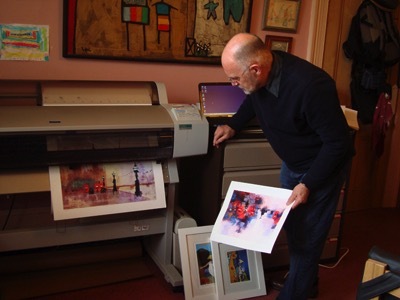 However, if the artist always intended the artwork to be in preparation for a print run then the resultant print can be described as a genuine print. It is also relevant who is doing the publishing. Obviously it is easy if you see a print by Leonardo da Vinci, or Michelangelo. These artists did not foresee that their paintings could be copied and massed produced as prints. Is it just a publisher who is jumping onto a bandwagon, or is it the artist who painted the picture? A contemporary artist is probably aware what is possible. And they may want this to happen. They may have even designed their artwork to be both a painting plus an image that will be the basis of a print. They might be commissioned to paint with the primary purpose being the subsequent print run. And an artist that self-publishes could create artwork with multiple end-purposes in mind. When an artist sits down and starts to etch out a copper plate or carve a wooden block, then it is obvious that this is going to be a print. If the artist makes a sketch in a notepad before starting the etching that is fair enough. And if the artist paints a picture, then etches a copper plate to make an etching inspired by their painting, fair enough again. But it can be a gradual process. Modern print making technology can also use photography in the image creation. Suppose an artist makes mixed media art involving painting, photography, screen printing, computer manipulation etc….what then? The resultant print matrix might be a digital file sitting on a computer waiting to be printed onto paper, canvas, or metal. The digital file can be adapted, saved, tweaked, enlarged, colour manipulated into many variations. Each print could be unique or in multiples. Each print can be printed on demand. A further complication is the emergence of another hybrid art-form, the acrylograph. An artist can make an image on paper or canvas, wood panel, wall, or wherever. The artist can use anything to make the art image. Then the whole image, or part of the image, can be captured photographically. Stored digitally, then manipulated using a computer, tweaked, flipped, re-coloured, textured, mixed, over laid, etc. Periodically a digital copy can be saved. The process can be continued thus building a whole complex library of image files based on the first ‘original’ image artwork. At any time the digital file can be printed out onto paper or canvas to make a print. Finally the artist can over-paint with new paint, or collage, or texture, or whatever. A new unique piece of art is created. This is an acrylograph. A good thing about acrylographs is that the artist can really examine the scope of an image. This can be by making a digital file record of a painting as it progresses, and then printing a tweaked version of the image, and then over-painting and exploring other development possibilities in the image. So the acrylograph is a hybrid art form. It is not a traditional print, or a reproduction, or an original painting. It is somewhere in between. Is it still relevant to call modern printmaking either one thing or another? ‘Original print’ or ‘reproduction’ can be a very over-simplified dichotomy.